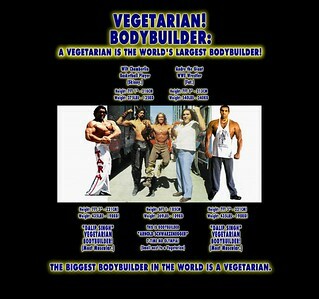 Vegetarian more muscular than Steak based high protein high fat diet which has lower muscle. The BEST Protein Sources for bodybilding are all Vegetarian, not meat. You can witness this yourself, simply enter any Bodybuilding Nutrition store, all of the PROTEIN is vegetarian and vegan. This includes WHEY PROTEIN (lacto-vegetarian), ALBUMIN PROTEIN (ovo-vegetarian), and SOY PROTEIN (vegan) which blocks estrogen so vegetarians and vegans have More testosterone than meat eaters. Steak contains mammalian estrogen. Didn't know that? Just put "SYNOVEX-S CATTLE" into Google and you will see the implants that cow farmers have been putting into steak. Look at the contents. It includes "estradiol". That's ladies' estrogen hormones. Steak is what contains women's hormone juices. You also see "progesterone". This is what women excrete during pregnancy. Soy does not contain estrogen, soy contains PHYTO-ESTROGEN, merely a plant compound which actually helps BLOCK and STOP the real effeminzing estrogen. Red Meat is what truly contains ladies' feminine menstruation hormones. This is why meat-eaters have Less testosterone than vegetarians (this was scientifically confirmed). Vegetarians do not have this problem. Each bite of juicy steak is soaked with a gush of female estrogen. If you think bodybuilding needs meat and vegetarians can't get protein, why are all the protein sources for muscle building in virtually every bodybuilding store Vegetarian? Think about it. The answer is that even the Cow the source of the steak was getting its protein from plants. Virtually all the BEST PROTEIN for building muscle comes from Plants. Steak eaters are eating vegetarians' "sloppy seconds". Plus, ingesting red meat which contains 17-beta-estradiol, makes omnivores and meat-eaters over time grow more feminine. Meat contains Ladies' Estrogen.